I really enjoy working on this project. It's so nice to assemble all those bright colors! soon the finished top. Greetings. 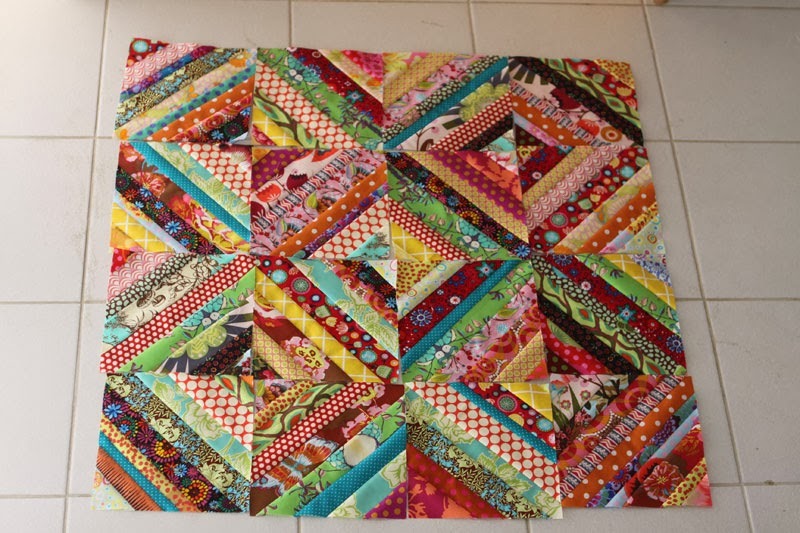 String quilts are always fun and yours is delightfully happy! This is so cheerful and happy! 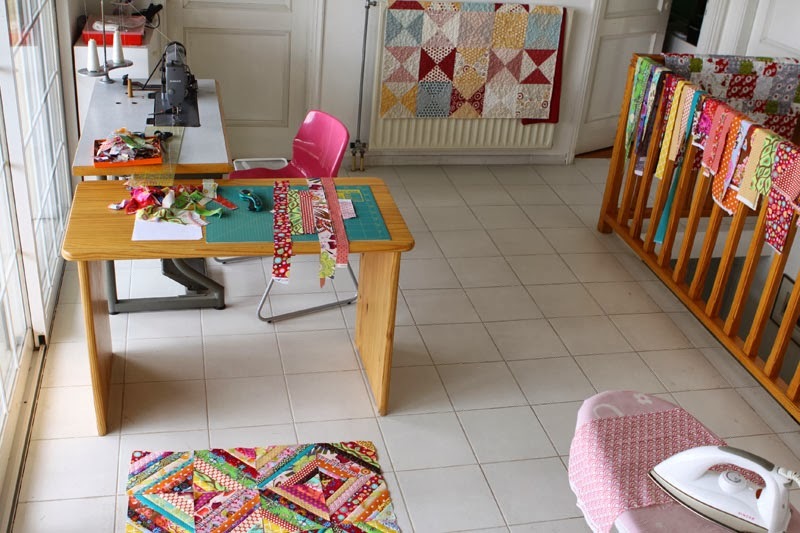 What a lovely, sunny sewing space you have. You've been making great progress, thanks for sharing. Thank you Diane, did you notice how quickly we progress when we are enthusiatic? 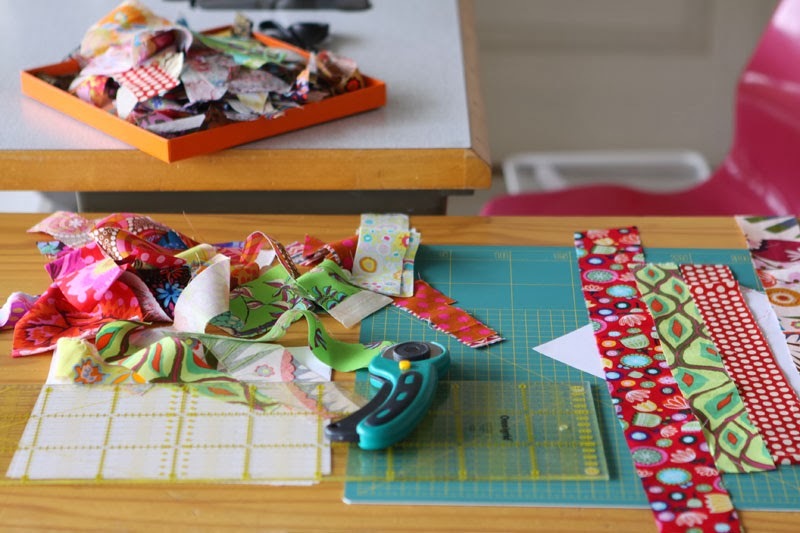 Your string fabrics are making a wonderful quilt, such a riot of color. You must be a fast sewer, it takes me forever to complete a few string blocks. The one I'm working on now is about half finished and I'm enjoying sewing the strings. Thank you! As a matter of fact I am a fast sewer when I enjoy the project. I love the brightness of the blocks! What a fabulous way to use up scraps!! Thanks Anna, scrap quilts are my favorite ones! Dit tu as mis le turbo depuis hier, Bravo il est magnifique, je n’imaginais pas bien le résultat, mais c'est très gai toutes ces couleurs et tres rapide ! Merci Christine, allez, lance toi, c'est tout simple! Bisous. 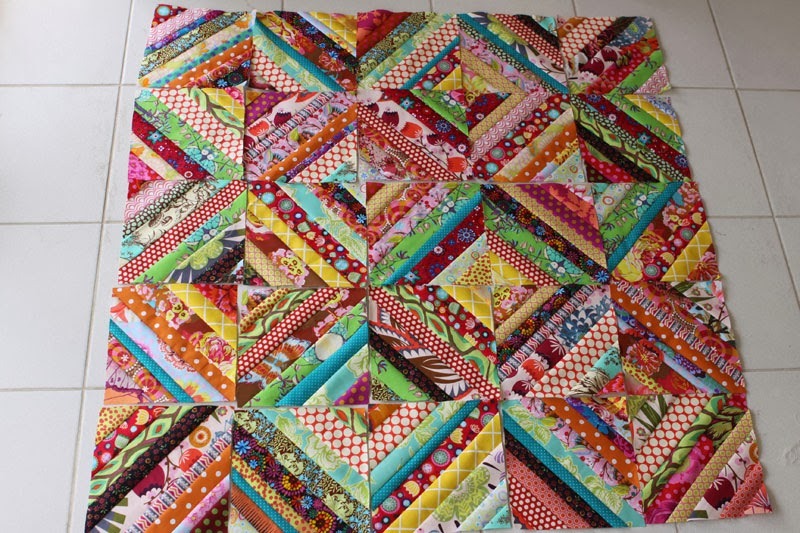 I love string quilts and yours is fun and lively! I have made a similar pattern quilt. Cut various lengths all different materials and sewed 4 right angles together. I remember have some scraps... I'm confused; why the paper? I use the paper to stabilize the fabrics. Love this and use of paper piecing. The colors are so wow, love it!